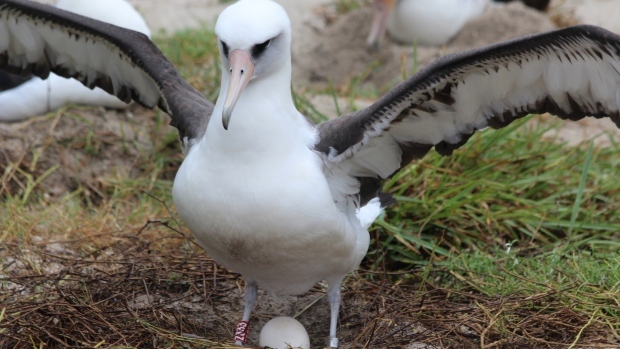 HONOLULU -- The world's oldest known wild seabird has laid another egg. U.S. Fish and Wildlife Service says the Laysan albatross named Wisdom appeared at her nest site at Midway Atoll National Wildlife refuge last month. The Honolulu Star-Advertiser reports biologists confirm she laid the egg. Wisdom and her mate return to the same site on Midway Atoll each year. Laysan albatrosses lay one egg and raise one chick per year. Biologists believe Wisdom is at least 68 years old. Biologist Chandler Robbins first identified and banded Wisdom in 1956. She has returned to Midway almost every year since 2002. Midway Atoll is home to the world's largest colony of albatross. The island about 1,930 kilometres northwest of Honolulu was the site of a pivotal World War II battle.